Paris, Ontario has a long association with phonographs. 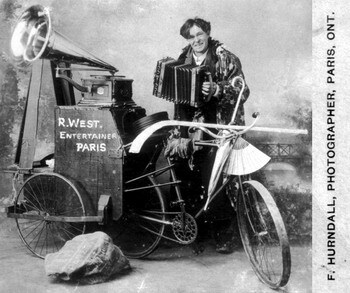 Remember the photo-postcard from about 1905 of the wonderfully-wacky R. West, Entertainer, which was used on the cover of a previous CAPS Membership Directory. The small town of Paris, Ontario (north and west of Hamilton), often plays host to a most interesting auction, which takes place about every 6 to 8 weeks. Inside an old converted church are often 700-plus items, most of which are from estate clear-outs, and usually consist of art, lamps, jewellery, furniture, rugs, china, etc. I hadn’t been to one of these auctions in about 5 or 6 years. I felt, however, that I could not ignore the auction of February 17th 2007, due to the description that was given in their pamphlet: "Super collection of antique gramophones & gramophone parts, --cylinders—1000’s of records, -- antique and retro radios…" I’m sure that anyone reading this newsletter would understand my excitement! My cousin Rob and his wife, Pina, were kind enough to do the hour plus driving from Toronto on this cold winter day. Listed below is a rough inventory of most of the phonograph-related pieces. In addition to the selling price, the lucky buyer can expect to pay a10% buyer’s premium, 7% Provincial Tax, and 6% Goods and Services Tax (so a 24% mark up can add considerably to the final invoice). In addition, there were a couple of other Edison Diamond Disc upright console machines (sorry, but I didn’t get the models) that sold for a very reasonable $150 and $200. Usually there are very few, if any, phonograph-related items at this auction. However, if you like other antique items, you may want to check it out to see what deals are available.